Best HD Action Camera For Car Racing? [important]Update: The orange and black Drift HD170 camera has been discontinued so availability has become severely limited. 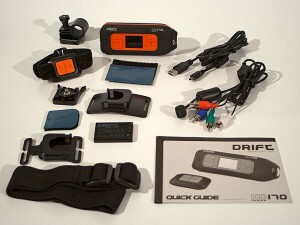 Drift Innovation’s closest model is the Drift HD170 Stealth camera which is a new and improved version of the HD170. 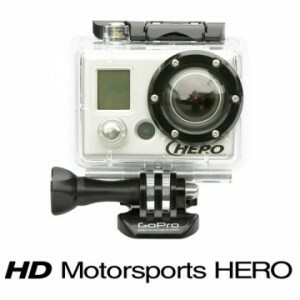 Tossing up whether to get a GoPro Hero HD 1080p or the Drift Innovation HD170? Let’s compare these two popular action cameras and review which one is the best overall by way of features, specs, reliability and of course price. Admittedly, both are great performing HD action cameras right out of the box, but what it really comes down to are the smaller features, the size and the price.. and of course, your taste in styling. Drift HD170 has a color monitor built in the side of the camera, where the GoPro 1080p doesn’t. Drift HD170 has a wrist attachable remote control for turning the camera on and off. Drift HD170 has a rotatable lens at the front so getting the shot right is a piece of cake. Everything you want in an Action camera? So far it’s looking like the Drift Innovation HD170 is streaking off to a big lead! Nearly all other features are the same. Both shoot great quality hi-def HD footage (1080p, 960p, 720p etc) with a range of frame rates for slow-motion replays, are water resistant and come with a plethora of mounts for any mounting option you can think of. It’s pretty easy to see that the GoPro model is quite a bit smaller than the HD170 model. Then again, you’ve got to remember that there needs to be extra room for a monitor on the side of the HD170. But if size is an issue, then it’s the GoPro.. but is that all that it has going for it? The size? Perhaps.. the name too? I understand some might be put off the Drift HD170’s design and color. It does look a little tacky at first, especially in the photos. Update: Have you seen the all-black colored HD170 Stealth camera yet? Looks a million times better with the all-black styling – very HOT! Here, tables turn a little again in favor of the GoPro HERO. Not a huge difference in price – about $25 – $30. For some this might be a deciding factor, but I don’t see it as a real major price gap. The Drift HD170 (HD170 Stealth Now Ony $249.99 Save $100!) from Drift Innovation gets 5 stars! It’s a complete package that you can’t go wrong with. I’m not knocking the GoPro HD at all. It is a very good camera that produces great HD videos. It comes a close second thanks to it’s small package and slightly lower price and if the extra luxuries of color screen and remote don’t matter, this would be a great one to get. Which is better for you? You’ll have to weigh up the differences and consider which is better for you and your application for it. I hope this review has revealed some extra info to help make your decision easier. The real deciding factors for me to choose the Drift over the GoPro was the Drift HD170’s built-in screen, remote control and rotatable lens. It is a little bigger than the GoPro but if you’re mounting it in or on your car or other motor vehicle, (even helmet) it isn’t be too heavy. If you’re dead set on getting the smallest and lightest camera available, the GoPro might be the better option. US and Canada customers get free shipping with any purchase over $99 plus you get a free filming guide. Australian customers also get free express post delivery to anywhere in the country when you order via the Australian retailer. EXCLUSIVE BONUS OFFER: All customers who buy a DriftHD170 Stealth or GoPro HERO (or any other camera) through a link on this website qualify for our free bonus offer. Click here for full details about the bonus offer. p.s. Remember that Drift Innovation has released a new smaller HD action camera called the Drift HD. It’s got all the same cool features of the bigger Stealth camera but comes in a smaller package and has a few improvements.